Scaffolding in the city in May usually means construction. 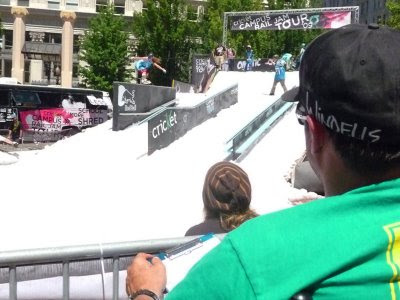 In this case, the folks at Cricket constructed a rail slope in Pioneer Courthouse Square and trucked in a few tons of snow for the slip 'n' slide. Hungry amateur riders have been hunting on the tour for months at various college campuses in the west. This was their final chance for fame and glory or at least a jackalope trophy and a briefcase full of cash. It was a hot one in P-Town. The usually gloomy skies rained down unfiltered UV. Speaking of raining down, the riders were bringing it. Noses were pressed, spins were spun and backsides were lipslided. OK that last one sounded dirty, but you know what I mean. The weird thing, the crowd wasn't that into it. Maybe the resident street walkers didn't know what was going on. Maybe it was the impending heat stroke, but they got louder for the thizzle dance contest than for the riders. Todd Richards did his best to keep folks awake, but in the end he too bent to sun and booze and looked comatose in the MC tower. Not before gratuitous spread eagle jokes aimed at the skiiers and multiple free boards given away for quintessential Portland props: tightest pants, longest hair on a dude and the first person with a fixed gear bike. He even gave away a Sheckler backpack for the worst tattoo. Classic. When the setup got shoveled off at the end, the real winners were, well, the sponsors. That's what this is all about, right!? All the views for all the sponsors. I won't name them individually, but you'll see their logos in my pictures, no doubt. I guess I'm pretty stoked that they could put their money into a snowboard event instead of just another TV ad. Props for that. The actual winners were Mt. Hood loc Randa Shahin for the ladies and Josh Bishop for the guys. Check the pics for more action. Spring foliage and an antique streetlight. Right, and a front board. This lady busted out a thizzle dance win for some free gear. Right back at ya, Todd. Portland MC, Luck-One kept the ladies' attention. Your winner: Randa Shahin with a fat stack of cash. Winner: Josh Bishop with the goods.